Q: I can't figure out how to get menu items to swap images to use like a traditional image rollover. In the Dhtml menu, I can change the style background without needing images, or I can use generic images as a background, but I have situations where I need to use unique images for each state of a button. 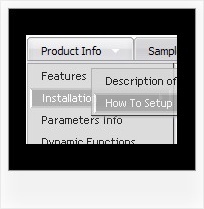 These unique image buttons contain text and graphics, and there are different images for different states: normal, mouse over, mouse down. You should use "itemBackImage" parameter. Q: Can a drop down menu go over a Flash and be transparent?Let me know. Q: For example if you use the Growing Goodness menu located under Media Categories the first category is Agriculture w/ a sub category "Community Supported (CSA)" it is the sub category that is an active link. Is it possible to have only the active link "Community Supported (CSA) underlined and not Agriculture? And the same for all the other active links in this menu, all that have hyperlinks assigned to them.